The stuffing is prepared, the turkey is in the oven.... Are you now wondering what to make for your sides? 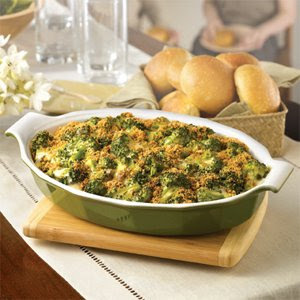 Let me share two of my favorite casseroles from Campbell's® Kitchen- the Broccoli & Cheese Casserole, and the Green Bean Casserole! Both are incredibly simple dishes and promise to be a hit at any Southern Table! Mix the bread crumbs with the butter in a small bowl and sprinkle over the broccoli mixture. Bake at 350°F. for 30 minutes or until hot. Rice Is Nice: Add 2 cups cooked white rice to the broccoli mixture. Cheese Change-Up: Use mozzarella cheese for Cheddar. Stir the soup, milk, soy, black pepper, beans and 1 1/3 cups onions in a 3-quart casserole. Bake at 350°F. for 25 minutes or until the bean mixture is hot and bubbling. Stir the bean mixture and top with the remaining onions. For A Festive Touch: Add 1/2 cup chopped red pepper to the bean mixture. Green Bean Casserole Cheese Lovers: Omit the soy sauce. Add 1/2 cup shredded Cheddar cheese to the bean mixture.